Just a quick heads up to our great existing and new prospective customers that we now have a simplified website layout for easier navigation of our site. You can see the new layout at http://www.LakeErieToolworks.com – Hope this hits the mark. 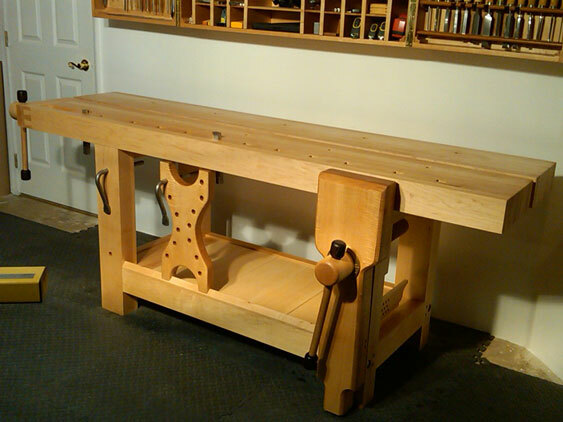 Adding our April 2013 Workbench of the Month from Robert P. of Bear, Delaware to our Lake Erie Toolworks Blog for ease of access and historical awareness. Here are pictures for your workbench contest. This is my left-handed split top with two Lake Erie wooden screws for the leg vise and wagon vise. 34 inches high, 24 wide, 88 long, hard maple base and 4 inch top. Tiger maple for leg vise, deadman, and handles. Wenge handle caps. Danish oil finish. 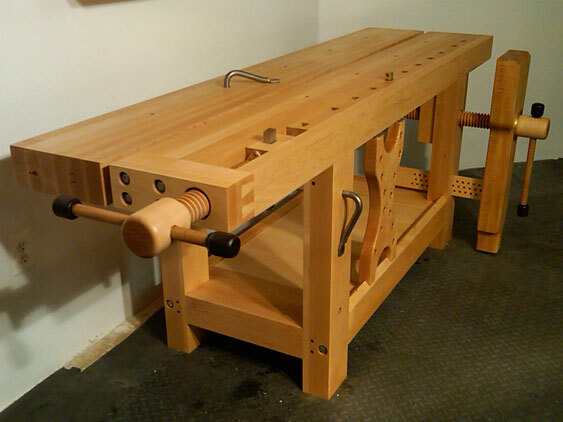 The bench journey: I have been a hobbyist woodworker for 30 years. Years ago I purchased a very old leg vise with two 3 foot wooden jaws, metal screw-handle-and angle iron metal jaw caps. While it was a metal working vise, I used it my shop and loved the leg vise concept. In about 2001, I inherited from my father a pre-1900 German workbench that was weak, with rotten parts, a 2 inch warped knotty slab for a top, and two wooden screws for the face vise and tail vise. I faced a dilemma to keep the antique bench historical but not really functional or totally refurbish it piece by piece. The restored bench turned out great, but I still wanted to build a new bench. I read all the books, and analyzed all the styles and functions of benches, and all the new vises on the market. From the antique bench I learned I didn’t want a pedestal base, a tool tray, a 2 inch top, a small face vise or a tail vise, but I did want two wooden screws and a leg vise (but no metal vise screws). I purchased the split top bench plans of a metal vise manufacturer, but purchased the Lake Erie wooden screw for the leg vise. I completed the entire base with the leg vise and deadman, and the back half of the top, but my new bench project stalled for over a year as I was not satisfied with the options for an end vise and not able to figure out how to use a Lake Erie large wooden screw for a wagon vise. Finally I contacted Nick at Lake Erie Toolworks who advised he was designing a wooden screw for a wagon vise. 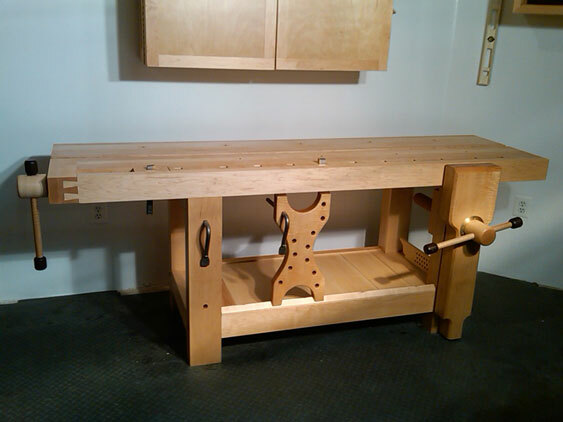 I waited, and after the availability of the Lake Erie wagon vise in the fall of 2012, I finally finished my bench. I am super pleased with both vises as they work very smoothly.